This entry was posted in Midd Blogosphere and tagged Midd Points on August 6, 2018 by Petar Mitrevski. Google is discontinuing the Google Drive software that synchronizes files from your computer to the cloud. The software is being replaced with two new options, outlined in our Google Drive Notice. The Google Drive online service (https://drive.google.com) is not changing, and can be accessed on the web or using one of the replacements below. On December 11, 2017 Google stopped supporting the Drive software. On March 12, 2018, the Drive software will stop working. If you use Google Drive strictly via the website (https://drive.google.com) and do not use the Google Drive software on your Mac or PC to synchronize your files to the cloud, then you will not be affected by the changes listed below. However, you should still consider the new functionality offered by Google and described in our Google Drive Notice. ITS recommends that users of the Google Drive software install Drive File Stream to access their Middlebury Google Drive. Drive File Stream frees up disk space, decreases sync time and minimizes the amount of Middlebury data stored on your computer. The other option available, Backup and Sync, does not offer these advantages. To install Drive File Stream, for a comparison of options or for more information, please see the Google Drive Notice. This entry was posted in Midd Blogosphere and tagged Midd Points on January 3, 2018 by Petar Mitrevski. For example, if you wanted to place a call from the Service Building room 209 to Van Buren 499, you would simply enter 831499 on the videoconferencing unit in room 209. Similarly, if Van Buren 499 wanted to place a call to our RAJ room, simply enter 802803 on the videoconferencing unit in Van Buren. However, if another institution (e.g. another college) wanted to call any one of our rooms, they would still need to dial the IP address. Similarly, if you needed to dial to another institution (e.g. another college) you would still need to dial the other institutions’s IP address. Dialing the alias will route the call through our new infrastructure, ensuring call quality & reliability. In addition, dialing the alias will make it quicker and easier to make calls between our locations, since it’s shorter and easier to remember. Please do not hesitate to contact the Help Desk if you have any questions. This entry was posted in Midd Blogosphere and tagged For Faculty, For Staff on November 5, 2013 by Petar Mitrevski. This is a reminder and an update since our post in April regarding removal of VHS and LaserDisc players from classrooms starting January 1, 2014. This is an important notice about the analog video format. It relates to the phasing out analog media and analog players (VCR, Laserdisc [LD] and slide projectors) in the classrooms at Middlebury College. Please review the next sections for information on the reasons behind this and the approach that LIS plans to undertake. Analog media (VHS, Betamax, U-matic, etc.) and certain digital media (LaserDiscs) have become obsolete – new media are not being produced, nor are replacement players. For LaserDisc and VCR technology, better, higher quality, and easier to use digital technologies have emerged. By removing these media players players and slide projectors from classrooms, and by replacing these older formats with digital ones, we can ensure that our classrooms will continue to be functional, easy to use, and easy to support, both now and in the near future. The media and computer industries have chosen to retire certain older audio and video technologies and move to newer digital audio and video formats. This means the imminent death of VHS, LaserDisc, 3/4″ tape and, eventually, even our beloved VGA (and possibly even 16mm and 35mm film, but we don’t know that quite yet). BluRay (using a newer connection type – HDMI) and streaming Internet video are the newer formats intended to replace all of the aforementioned older media formats. The DVD format remains alive, for now. Phase I – Beginning January 1, 2013 LIS will no longer add VHS players to new or renovated classrooms. Current status: VHS players were not added to any of the Warner classrooms after the renovations in January, 2013. VCRs were also not added to the new smart classrooms in Twilight (May/June 2013). Phase II – Beginning January 1, 2014 LIS will begin removing VHS, LaserDisc, and slide projectors from all classrooms except for the main auditoriums (Sunderland Dana, Alexander Twilight Auditorium, and Axinn 232). We need to preserve as many of these devices as possible for spare parts and archival purposes. Phase III – Onward and upward. LIS will continue to move forward with digital technology, including investigating reliable streaming options, and strive to accommodate any emerging technologies for the future. Over the past two years, LIS has replaced a large amount of analog and obsolete media (VHS & LaserDisc) placed on Library Reserves with DVD or Blu-Ray media. Last winter, a large LaserDisc deselection project reduced our holdings by almost 90% and was lauded by staff and faculty as a strong step forward. In the past year we’ve been turning our attention to the VHS collection, targeting those items which have never circulated, which reduced our holdings by over 35%. We are currently in the process of removing VHS copies of works for which we also have DVD and/or Blu-Ray versions. Other VHS titles have not circulated at all in the past seven years (i.e., since our migration of MIDCAT to the current platform), and we are reviewing those titles with faculty input and assistance. Individual departments should check their collection of media titles for VHS items. If any are crucial for teaching or research, LIS can attempt to purchase new copies in modern format (DVD or Blu-Ray) if we do not already have them. If these formats are not available, we will retain the VHS. All other VHS will be removed from the collection. Our classrooms will continue to have the option of bringing in an analog or obsolete digital device (VCR, LaserDisc player, slide projector) for the foreseeable future. LIS maintains an inventory of VCRs, LaserDisc players, and slide projectors in functional condition available for check-out from the Library circulation desk. However, there is no guarantee that we will be able to maintain and repair these devices indefinitely, as new supplies dwindle. We are following similar steps with our collection of aging audio cassettes. Cassettes that have never circulated in the past seven years are being reviewed. Cassettes that have been put on reserve or that have circulated will be replaced, retained, or migrated to a newer format. Please place individual requests to purchase replacements VHS/LaserDisc media at go/requests. If you currently have a VHS tape, Laserdisc or 35mm slides that you use for class, you should be developing a strategy for migrating the class material to a different media for use inside and outside of class. Look for DVD, Blu-Ray or (legal) Internet video replacements for any VHS, LaserDisc, 3/4″ tape, or Betamax titles in your personal collection. The Library (go/requests) or your liaison (go/liaisons) can assist you with this. If a commercial digital copy is available we will attempt to purchase a replacement; processing times will vary based on availability. Before any in-house conversion of analog or obsolete digital formats is done, however, we need to determine the legality of the duplication request. Expect about 5 business days for the copyright question to be resolved (this can be a somewhat complex issue) and another 5 business days for the actual conversion. We are looking for feedback on the plan, the process and our communications. You can reach out to your LIS liaison or contact me (Petar Mitrevski) directly. You can also post a response right here on the blog and start a lively discussion. We emphasize the analog sunset whenever we receive a report that a VCR player or VHS tape is broken. We have shared this plan with the Faculty LIS Advisory Group (FLAC) and are working to incorporate their feedback. LIS liaisons will continue to work with each academic department to share this plan and engage in discussion. We have talked about the analog sunset in our December Quarterly Update, April Quarterly Update, and in the context of the recent classroom renovations in Warner. But we need more input from our community. Thank you! You can read the entire plan at http://go.middlebury.edu/analog. In addition, we’ve developed an FAQ section based on questions from our community. You can also check what other schools are doing to address the issue. This entry was posted in Midd Blogosphere and tagged For Faculty, For Staff on September 23, 2013 by Petar Mitrevski. As of Friday, September 6th, 2013, LIS switched over all videoconferencing rooms at Middlebury to a new, more reliable network for videoconferencing. As a result, our IP addresses have changed. If you schedule and run videoconferences without LIS support, you should be aware of the new IP addresses. The new addresses can be found on this page (login required). Please contact the Help Desk if you have any questions. This entry was posted in Midd Blogosphere and tagged For Faculty, For Staff on September 9, 2013 by Petar Mitrevski. This entry was posted in Midd Blogosphere and tagged For Faculty, For Staff on August 30, 2013 by Petar Mitrevski. More than half of our classrooms have been standardized on one type of touch panel (Extron). By the end of the upcoming academic year, close to three quarters will have the same type of touch panel. 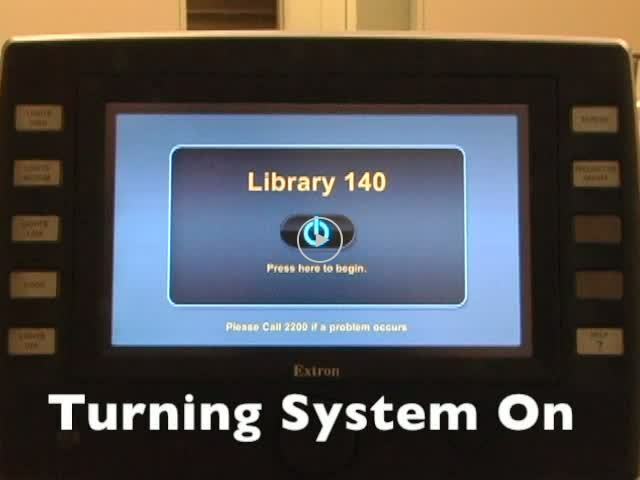 The video shows the touch panel from Davis Library room 140, but other than the room name, the layout is the same across our other classrooms of this type (Extron). Any questions or feedback are welcome! This entry was posted in Midd Blogosphere and tagged For Faculty, For Staff on August 16, 2013 by Petar Mitrevski.